To the gastronomically driven RVer, there’s nothing much more discouraging than the food supply not being edible. For some of us, hot food should be hot, and cold food, REALLY COLD. Sad to say, for many RVers, the refrigerator seems to be a mystery appliance, and many find themselves suffering not-so-cold stuff. Keeping your food cold with an RV refrigerator requires a little different line of thinking than the chill-box back home. As you may know, your RV fridge needs to stay as close to level as possible. Recent vintage ones a little less, so, but all RV reefers work better when level. So keep a bubble level in the box. Ideally, check the level of the chill plate in your freezer. If you’re within a third of a bubble all the way around, you’re good. If not, re-level the rig. You’re OK while the coach is moving down the road; the jiggling will keep things working. But when parked, the refrigerator should be level or turned off. It’s best to turn your refrigerator on a day before you pack food into it. Turning on the refrigerator, especially if the gas supply has run out or been turned off, means a sort of priming ordeal. Here’s the trick: Before you turn on the reefer, check the gas. Make sure the gas supply is turned on, then step into the galley and light a stove burner. This purges the gas line running to the kitchen, and once you’ve got a good solid stove flame, turn on the refrigerator in GAS mode. It may take a start or two, but it should come on. We start ours on gas to make sure all is OK, then flip it back to shore power electric while pre-chilling the refrigerator. If you’re on a lightweight extension cord, you may find it’s not heavy enough to keep the refrigerator electric element happy. If that’s the case, just keep the refrigerator set to LP. After the refrigerator has run for a couple of hours, come back and put your hand in the freezer, and check out the cooling coils in the back of the refrigerator compartment. By now they should be decidedly cool. That’s the sign that you can leave the rig alone until it’s time to pack your food. When you do pack food in the refrigerator, make sure the food is already cold. Home refrigerators do a much better job of cooling down warm stuff then do RV chillers. Sure, you can throw a few warm sodas in there, but by-and-large, it’s best that anything you stick inside is good and cold already. There are two schools of thought regarding operating your refrigerator while driving. One side sees no problem with it; the other, a safety-conscious group, worries about driving with LP running in the rig. If there were to be a traffic accident, they reason, or if a vibrating LP line broke loose, there could be serious repercussions. Generally speaking, you can leave the refrigerator off and closed for several hours of “road time” without any significant food warm-up issues. That may not be the case in hot climates, where triple digit temperatures can raise your refrigerator interior temps above the safety point. Ask us: We once had a doozy of a case of food poisoning related to this issue. What’s to be done? You may have a three-way refrigerator: one that operates on shore power, LP gas, and 12-volt direct current power. If you opt to operate the fridge on 12-volt, you’ll need to “get off” 12 volts when your tow vehicle or motorhome engine isn’t running. RV refrigerators running on electricity use gobs of power, and you can quickly deplete your “house” battery. When it comes to ice cubes (we love our drinks cold), we’ve found it’s just easier to buy ice and stuff it in the freezer, rather than trying to make up enough cubes in a tray. If you don’t have room for a full bag, some fast food joints will sell you a smaller quantity. And here’s a trick an experienced RVer taught us. Finding a great deal on frozen meat just before heading back toward home base, she went ahead and bought up a big lot of it. She stuffed what she could of the hard-frozen meat in the RV freezer, and the balance she put in a well-insulated camping ice chest. She would then swap the contents of the ice chest for those in the freezer, rotating them back and forth. Nothing ever came close to thawing out this way, and she was able to carry almost twice the capacity of her RV freezer safely home. There are some things that can cause your RV fridge to go out on strike. A common issue is found at the back of the cooler, accessed through the outside access door. RV refrigerators use heat from a propane flame to “cool” the box. At times, crud has been known to drop out of the chimney above the burner flame, right onto the burner unit. That can kill the flame, leaving you with no cooling action. If your fridge stops cooling and you can’t figure out why, go outside and open the refrigerator access door. In some cases you’ll find a little peephole door near the bottom of the fridge unit, at the base of a cylindrical or rectangular box-like chimney. Open the peephole (use caution as it could be hot) and see if there’s a burner flame. If not, you may find oxidized corruption stacked up on the burner. No peep hole? Carefully touch the “stack,” which should be hot if the burner flame is present. If you suspect there’s no burner flame, you’ll need to shut down the refrigerator, and using a screwdriver or nutdriver, remove some tin from around the burner unit. Use either a shop vac or a can of pressurized air to remove the detritus from the burner. Attempt to relight the burner by turning on the refrigerator. That may be all you need to get back in the chill zone. New RV’s and refrigerators in slide outs.. Do you have poor cooling on hot days and an cooling fan that never stops? This is a cure I have not seen anywhere. Chances are there is a poor ventilation situation occurring. We just bought a brand RV with a new 8 cu foot refrigerator that was cool on cool mornings and ran poor to fair on hot days 5 – 30 degrees in the freezer & 45 – 65 in the lower section. The low temp was on cool mornings and nights with the outdoor temp about 45 degrees which produced the low fridge temps and with the 85 degree daytime outdoor temp in the shade that produced the upper range fridge temps… Obviously nothing was safe as far as food storage with these poor conditions. Everything was checked and compared to the installation manual. There were a few things that needed correcting such as to properly vent the air at the top portion of the fridge above the cooling fins on the rear. This was done with the aluminum faced flexible 1/4″ thick foam is sold in rolls at the hadware store and aluminum 2″ furnace tape. That will direct the airflow out of the upper cavity and not let it “sit” above the refridgerator in the compartment that needs to be cooled. After several tests and corrections to meet the installation guidelines. nothing corrected the poor cooling situation. This is even worse for larger double door units.. The cooling fan in the rear was blowing up through the cooling fins fine but it was not forcing the hot air behind the refrigerator in the ventilation cavity out of the vent on the top of the slideout. The air was simply blown in a circular motion in the cavity and barely any air could be felt leaving the air vent. We installed a solid insert ( baffle) across the ventilation chamber Just below the cooling fins and created a hole the size of the fan itself. The fan was now able to force the hot air out of the chamber and cool the fins and coolant far exceeding the needed air flow required on hot days. Finally a 90 cu foot per minute fan blows that much out the vent and all is well.. These things need to be done for proper installation and maximum cooling. Now we have -15 in the freezer and 35 degrees in the lower section..
Where are the pictures of what and how you did it. 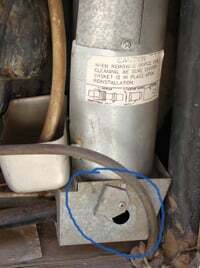 This write up does not help me do the same thing as you did to fix the cooling problem with your rv refrigerator.